(2002), pp. 248, 5 maps, 4 col. 55 b/w illus., 25 x 17 cm, paperback. ISBN 09518382 2 9. The descriptions of three major gentry households - Smithills from the 1580s to the 1600s, Tabley from the 1630s to the 1680s and Arley between 1740 and 1780 are contrasted with the lives of more ordinary people. The Fells of Swarthmoor were much engaged in business, Thomas Jackson and Richard Latham were brought up on 15 and 20 acre farms while George Dockwra lived quietly on a small pension as a lodger in a farmhouse. These detailed examples were designed to support and enrich the thesis set out in the fourth and final volume of this series. 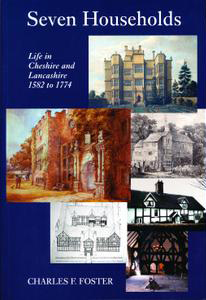 This volume depicts the economic lives of middling and gentry households in Lancashire and Cheshire in a wealth of fascinating detail, with important insights into the management of daily life, household and production economies in the early modern period. It focuses on family and estate accounts books through seven case studies. Through these series of examples he is able to illustrate how, by the mid-seventeenth century, North West England had developed from an inward looking, subsistence economy to a region increasingly integrated into national markets for food, trade, raw materials and finished products. Foster's case studies place these large - scale economic changes on a human level and are particularly instructive about hidden activities, such as servants&apos; personal economy, or the mechanics of production processes in this region. He demonstrates a comprehensive understanding of the financial detail and economic context in which these accounts were created. As with the author&apos;s three other studies of economic life in Lancashire and Cheshire, the primary function of this research will probably be to yield a seam of worked-up, well - explained examples for professional historians. Such users may regret that the case studies are presented individually, rather than being integrated into a general interpretation of economic and social change in the region, although Foster has subsequently supplied this in his larger study Capital and Innovation (Arley Hall Press 2004). However this earlier piece of research is more that a narrowly conceived work of local history and deserves to be read as an important regional case study by those interested in the social, economic and business history of England in this period. R. French, University of Exeter.